When going out to enjoy tonight's festivities, it is essential to have stable and steady footwear...thank goodness for athletic shoes. And just because you're rocking sneakers doesn't mean color coordinating your wardrobe has to be sacrificed. 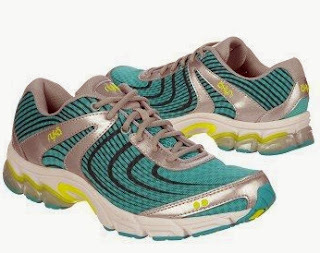 If you're looking to top off your green wardrobe for St. Patrick’s Day, women’s fitness brand, Ryka, has a variety of shoes in shades of green, like their Ryka Motive Sneakers. Whether you're attending the parade, hanging out at a local pub or simply working out, these lightweight running sneakers will carry you form celebration to celebration. These cool green sneakers feature a synthetic and air mesh upper, lace-up front, padded tongue and collar, Scotchgard(TM) Defender water-resistant treatment, a minimal designed-silouette for a natural foot strike, a cushioned Precise-Return(TM) insole, molded EVA midsole boasting a N2-DM shock absorbing heel cushioning, S.G.S medial support and a four-piece skeletal rubber outsole.